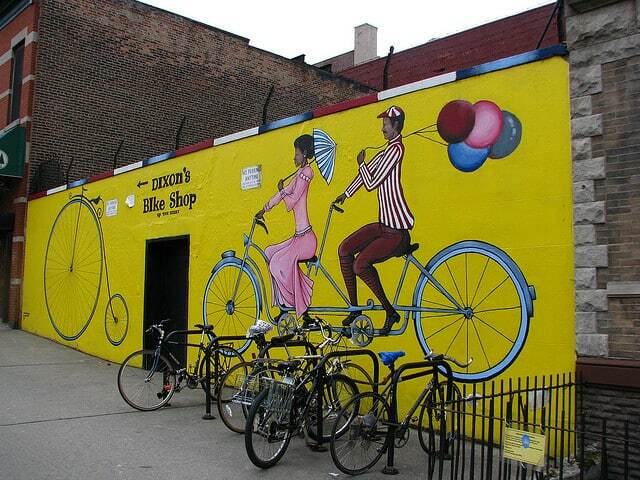 Learn about trends in the Bicycle Shop and where to find more info about how to open your own Bicycle Shop. Don’t forget you can receive free or low-cost training and free professional business advice, from your local Small Business Development Center! Get a free Bicycle Shop business plan template on our Business Plans page. The following bicycle industry statistics and trends are from the National Bicycle Dealer Association 2011 Bicycle Industry Overview. It is highly recommended that existing and prospective bike shop owners visit the NBDA site to take advantage of the many resources (both free and for purchase). Direct effect sales of bicycles, including related parts and accessories, and through all channels of distribution, reached $6 billion in 2011, virtually unchanged from $6 billion in 2010. NBDA estimates that the size of the industry has remained stable since 2003, with sales fluctuating between $5.8 billion and $6.1 billion. The bicycle industry has 5 principal sales channels: specialty retailers, mass merchants, full-line (chain) sporting goods stores, outdoor specialty stores, and “other” which is a mixture of retailers including internet sales. Mass merchants accounted for about 70% of unit sales, but only 27% of dollar volume due to the lower average sales price of bikes ($84). Further, this channel experienced 2011 market share erosion from 2010 levels, relative to other distribution channels. The 4,178 specialty bicycle retailers accounted for 18% of unit sales volume in 2011, but garnered 55% of dollar volume due to an average unit price of $680. BikeShopList.comreports that the number of specialty bike shop locations has declined since 2001, however NBDA reports that specialty bike shop unit sales have not: NBDA concludes that specialty bike stores are becoming larger on average. Specialty bike retailers were the only bicycle distribution channel to maintain or increase per unit sales prices, and the channel as a whole experienced market share gains relative to other channels. New bicycle sales make up 41% of revenue for specialty retailers. These retailers emphasize quality merchandise, and add value with specialty services like bike fitting, assembly, repair and community engagement activities. Chain sporting goods stores accounted for about 7% of unit sales volume, 8% of dollar volume in 2011, had an average selling price of $249, and this channel saw modest market share gains in 2011 over 2010. Outdoor specialty retailers accounted for about 2% of unit sales volume, 5% of dollar volume, had an average selling price of $590, and the sales trend line is considered stable. The “other” category accounted for 3% of units sold, 5% of dollar volume, and had an average sales price of $380. While bicycling remains primarily a recreational activity, riding for transportation/commuting continues to evolve and grow. For example, BikesBelongand other advocacy groups, along with many local governments, are working to build and/or improve cycling programs and infrastructure to support cycling as an important element of transportation solutions. Unit sales of bicycles peaked in the 1970s, but the industry is thought to be stronger today due to a broader base of 2,000 companies involved in manufacturing and distributing cycling products, with 150 bicycle brand names. Further, today’s bikes offer greater comfort, better reliability and broader appeal to a large spectrum of potential customers that reaches across gender, age, cycling purpose and ability. Bicycle sales by type of bike for 2011, were: Road/700c (24%), Mountain bike (23%), Hybrid/cross (20%), Comfort (14%), Youth (12%), Cruiser (6%), Recumbent/Tandem (1%), Folding (0.4%), and Electric (0.3%). The chart below provides more data for prior years. Imported bicycles dominate the U.S. bicycle market, accounting for a 99% share, with 93% of bicycles imported from China and 6% from Taiwan. Brands like Schwinn, Mongoose, Roadmaster, Magna, Huffy figure prominently in the mass merchandiser sales channel and are made in China. Even bikes sold at specialty retailers are frequently manufactured in Asia, although their design and development may be performed in the U.S. or Europe. U.S. production of bicycles is estimated at approximately 56,000 units, out of total annual bicycle sales of 15 to 20 million units. Average bike shop gross revenue of $866,817 in 2011, generated from a 5,000 square foot bike shop. 84% of bike shop owners have one location and 92.8% had 2 locations or less. Bike shop revenue sources: 47.4% bicycles, 35.5% parts and accessories, 10.7% repairs, 0.8% bike rental, 1.9% fitness equipment, 3.5% other. Average bike shop sells 650 bicycles per year, carries 5 brands, many more accessory brands. Gross margins on bicycles average 37%, but break-even is typically 38.6%. Fortunately, gross margins on hard goods are 48%. This Bicycle Shop market research report summary is from IBISWorld which also sells a full version of this report. The slower economy of recent years was a bad news/good news story for many bicycle shop owners. The bad news was many bicycle shop customers postponed purchases of new bicycles. The good news was many of these same customers had their used bicycles repaired by their local bike shop. Greater revenues received for repair work were not enough to offset lost sales of high margin new bicycles and related gear. Overall, bicycle industry revenue declined at an average annual rate of 0.3% over the previous 5 years, but when yearend figures are released, IBIS World expects bicycle shop revenues increased by 2.8% in 2012. Going forward through 2017, IBIS World expects bicycle dealerships and repair shops to participate in the general economic recovery: bicycle industry revenues are expected to inflate by an average annual rate of 2.2% to $6.8 billion. Even the bike shop business is affected by broader international economic trends: rising oil costs could lead to increased ridership (and more trips to the bike repair shop). Possibly offsetting this trend could be a depreciation of the U.S. dollar, which would raise the cost of many foreign made bicycles that are so popular in local bike shops. Despite the allure of a new bicycle, IBIS World thinks bike store operators will be hard-pressed to simply pass through the full price impact to bike shop customers due to the widespread availability of lower-priced bikes at big box retailers. These large discount stores now account for approximately 75.0% of total bicycle sales. Another factor affecting bicycle shop success is the amount of free time potential bike shop customers have to spend on leisure activities. IBISWorld projects about a 2% decline in available free time over the next 5 years due to expected improvements in the labor market associated with an expanding economy. This means that consumers will have the option to choose,at the margin, work over leisure. The 2011 National Sporting Goods Association Participation Survey said there were 39.1 million bicycle riders in the U.S. The bicycling participation rate ranks very highly alongside other pastimes like exercise walking (97.1), exercising with equipment (55.5), swimming (46.0), camping (42.8), aerobic exercising (42.0), hiking (39.1), and running/jogging (38.7). In 2011, 5.3 million bicycle riders were frequent participants, riding 110+ days per year. Participation rates were disproportionately higher for 45 to 54 year olds (14.7% participate, yet only make up 7.2% of general population), and 55 to 64 year olds (10.6% participate, yet only make up 4.2% of general population). These disproportionately higher participation rates existed among both male and female bike riders in these same age cohorts. Bicycle riding is also a popular family activity, with 56.7% riding with at least one child (under 18). According to SBRNet.com sport participation reports, in 2011, 41.7% of bike riders had household incomes of $75,000 or more, 17.3% had household incomes from $50,000 to $74,999, and 11.7% had household incomes from $35,000 to $49,999. Bicycle riding is more common in larger metropolitan statistical areas, where 54.9% of participants lived in MSAs with populations exceeding 2 million, and an additional 20.8% of participants lived in MSAs with populations fo 500,000 to 1,999,999. Startupbizhub.com estimates bicycle shop startup costs to be $20,000 to $90,000. Startingabiz.com estimates the cost of opening a bike shop to be $70,000 to $100,000. Entrepreneur.com estimates the start-up costs for Bicycle Shop to be: $2,000 – $10,000. National Bicycle Dealers Association Want to Start a Bike Shop? List of bicycle shop suppliers, distributors, wholesalers from Thomasnet, a free site, is a national directory for industrial manufacturers and related articles searchable by keyword, state or nationwide. The 20 Most Popular Bike Brands Sold in the US from about-bicycles.com. For the full text of any content in this Small Business Market Research Report from SBDCNet, the link has been provided for the report publisher, while a database article can be obtained from the local public or academic library or purchased from a document delivery service for a nominal fee.